– Do we make too much out of them? I have always been fascinated with our use of suffixes in names, such as “Senior” or “Junior.” I look upon the use of such monikers as a desperate cry for attention. Years ago I had a friend who put “Senior” after his name on business cards. Knowing he had no offspring yet, I asked why he did this. He explained it was wishful thinking on his part to someday have a son to carry on the family name. Of course, he was blessed with a trio of girls and eventually dropped the suffix. Then there are the people who add Roman Numerals after their name to indicate they are the second, third, fourth, or whatever to bear the same name. I guess they see this as a way to add class and dignity to the family name. I think the highest was a “V” representing five people with the same boring name. I am tempted to add the Roman Numerals “MLXVII” to the end of my name, thereby confusing people or allowing them to believe there has been 1,067 generations of Tim Bryce. That should scare them. In academia, Doctors use Ph.D. which actually means Doctor of Philosophy, or to be more literal, it is Latin for Philosophiae Doctor. The idea that a doctor is a philosopher in the strictest sense, isn’t very comforting if you are in the hospital where I would rather be treated by an MD (Medical Doctor, or Doctor of Medicine). In business there are the MBAs representing a Master’s degree in Business Administration. Interestingly, you do not see too many people denoting their Bachelor’s degree. I can only assume they are ashamed of the title as compared to the Ph.D. or MBA. As for me, I’m proud to say I hold a BSC degree, representing a Bachelor of Science degree in Communications. I worked hard for this and am proud of the designation, but I do not print it on my business cards. Depending on the line of work we select, there are often many certifications we can claim. The entertainment industry is full of them, most notably the American Cinema Editors (ACE). In my field, the computer industry, there have been numerous certifications. For example, I was among the first group to hold the Certified Systems Professional (CSP) title which, unfortunately died after the country stopped building information systems and focused on software instead. A Certified Data Processor (CDP) was also a coveted title requiring several weeks of study and testing. This too faded from view and was replaced by something called the Certified Computing Professional (CCP). It kind of sounds like the old Soviet Union doesn’t it? 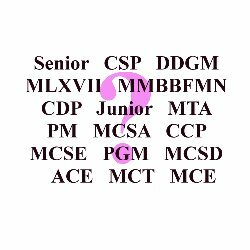 I would like to meet the guy who refers to himself as “John Doe, MTA, MCSA, MCSE, MCSD, MCT, MCE.” I do not believe there is a business card big enough to hold all this. Frankly, I believe this does more to advertise Microsoft products, than reveals any substantial skill. A few years ago, I tried an experiment whereby I signed my name as “Tim Bryce, LSMFT” which, of course, are the initials for “Lucky Strike Means Fine Tobacco,” an advertising scheme used for many years. I believe it is still printed on each pack of Luck Strike cigarettes. Nonetheless, very few people picked up on the ruse and were impressed by my title. Not many people asked me what it meant as they didn’t want to appear clueless. However, when someone asked me about it, I would explain what it meant and they would laugh, but then started to think about the point I was trying to make. I tend to believe we rely too heavily on these name suffixes. They’re pompous, arrogant and often result in negative political side effects. I’m of the age where I am no longer easily impressed. I have met way too many people with titles who are book smart but cannot produce a work product on time or within budget. I have also done my fair share of travel throughout the corporate world and have seen everything from the boardroom to the trenches. I certainly do not need another title. However, there are people who have led a sheltered existence and want to have their egos stroked with some form of recognition. These are the people who desperately seek such suffixes. As I started reading this, my first reaction, which was also my final conclusion, was that the writer has some sort of inferiority complex. I’m a junior. I have the same name as my father. I did not select this name, nor was I consulted about it when it was given to me. But, as a genealogist, I am well aware of how confusing it can be to later generations when they come across two, three and even four generations of men with the same name. If you find that Joseph Doaks owned a tract of land in Georgia, in say 1834, was that your great-great-grandfather, or his father, or his son? That is why I have always been careful to add that “Jr.” onto the end of my name: “Pierre G. Normand, Jr.” When I see that name I instantly recognize it as “me.” That is who I am. I am not “Pierre G. Normand.” That is my father. Without the “Jr.” at the end, it just doesn’t look like my name. I know this is hard to explain to someone who has never been a “Sr.” or a “Jr.” or a “III.” You’d have to walk a mile (or a decade) in my shoes, with my name, to know what I’m talking about. Sometimes I get mail addressed to “Pierre G. Normand.” It always strikes me funny, as my father has been dead for over 30 years. And, he never lived at my address, so why would they send him mail here, to this address? And yet, this Tim Bryce character thinks my use of “Jr.” at the end of my name is “a desperate cry for attention.” Really? So, rather than simply assume that it is what it is intended to be, a means to differentiate me from a man, my father, who had the same name, instead, he chooses to see it as something negative, pompous and arrogant. Wow. Sounds to me like someone has a huge chip on his shoulder. Then, he launches into attacking the use of suffixes in Freemasonry. I have to tell you that I have no objection to adding a “P.M.” to the end of some old brother’s name who is a Past Master of my lodge. I feel the same about a man who has a “P.G.M.” at the end of his name after he served as Grand Master of his grand lodge. That means that he put endless miles on his car for several years, serving in grand lodge offices, attended countless meetings, often dealing with how to find the money to repair buildings that were badly in need of repair, and countless other problems that I’d just as soon someone else worry about. I’m sorry, but I am not going to allow someone like Bryce to denigrate those who have served our fraternity, by letting him call them pompous and arrogant, just because they served US. I cannot stop him from doing it, but I can sure call him out, and point out that he is being small, petty and childish. Pierre G. “Pete” Normand, Jr., P.M. Fascinating. I find the name “Brother” much more in-line with the tenets of Freemasonry, a fraternity which means “Brotherhood.” I have more Masonic suffixes than you can shake a stick at, yet there is nothing better than “Brother.” As to those who have earned the title like “PM” – who did they earn it for, themselves or the Craft? I like the concept the Swedish Masons employ, whereby the person is referred to as “Worshipful” or whatever during their year of service, but return to “Brother” after their term is complete. You are being obtuse. By referencing the term “Brother,” you are attempting to change the subject. No one said that there is any title better than Brother. Did it ever occur to you that they gave of their time, their efforts and hard work, and served their lodge for several years, without any thought of earning a title? Did it ever occur to you that they were being generous and selfless with their time? Hopefully, the time and effort they spent was rewarding, and they enjoyed the fellowship of other lodge members in the process. But, none of that matters now because Tim Bryce is going to diminish and denigrate their service by accusing them of only doing it to gain a few initials behind their name. Tim Bryce is going to enlighten us all so that we now realize that all these Past Masters are actually just greedy, self-serving politicians seeking to build their own resumés and add some titles to their name for arrogant and pompous reasons. What are you really angry about? Who are you really trying to get even with? P. G. “Pete” Normand, Jr., P.M.
Obtuse? Hardly. I understand the situation well. Yes, there are many people who have served their Lodge faithfully, as I have. And yet, I have met way too many who were chasing titles and aprons as opposed to doing anything of merit. As to anger, I believe you have the problem as you appear to have a closed mind and cannot see what is in front of you. Freemasonry is a beautiful logical concept that is often physically implemented in strange ways. A True Mason does not need any extra titles besides Brother! Because a Mason does what he does, or should do what he does, because it needs to be done, not because others watch over his shoulder or pat him on the back saying,” Job well done!” A Mason knows when he has done a good job as well as when he knows he has not done his all to the job. I thank you Brother Bryce for refreshing our minds as to what we as Masons are supposed to be doing in our communities, without recognition! Go in, do good, get out! Every Holy Book says that is what we should do, so, we should do it!!! It is a shame that the author chooses to devalue his “Brothers” by disparaging their legal given names. If this article focused on the use of post-nominals within the Lodge, it would have been an interesting debate. However, the opening two paragraphs do call into question the motive for his premise. If one cannot respect another person for using the name on his birth certificate, it is no doubt that he cannot accept any other earned titles used within various settings! Bryce did a good job of pointing out how silly some of the best of us can be at times. There are people in life who take things to an extreme. God forbid it if you don’t address these type of people by title. And i’m not just speaking of within our Craft. You’ll find them at work too. While it might be or might not be that these people are craving attention, i’m choosing to not deal with that. It’s very true that when we’ve worked hard to earn something like a title, we would want our respect. A problem for me (as well as with Bryce obviously ) is the arrogance and over-valuation sometimes attached with it. What i mean by over-valuation is placing too high of a meaning and importance on a title. We’re people first.